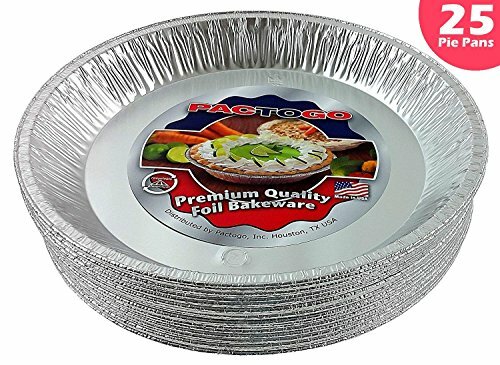 Premium quality 12" disposable aluminum foil pie pans. Dimension: Top-Out Diameter: 11.69" Top-In Diameter: 11" Bottom Diameter: 9" Vertical Depth: 1.37" Capacity (fl.oz.) 57.0. Very strong and sturdy, made with 50 gauge aluminum foil. Proudly made in the USA with American sourced materials. Premium quality 12" extra-deep pie pan baking tins, pack of 25. These pie plates are listed by the manufacturer as a 12" pie, however the manufacturer rounds up the actual top-out diameter which is just short of 12" at 11.69". The dimensions below list the precise measurements of this pan. These are the largest diameter and deepest disposable foil pie pans available on the market. Superior quality pie pans. Made with heavy 50 gauge disposable aluminum. Will not easily crush or bend. Intended for one-time use. Made with 100% recyclable aluminum. Stack very well for easy storage. Widely used by many high end bakeries, restaurants and caterers across America. No more messy clean ups, bake directly in pan, serve and discard/recycle. Ideal for large pies, sweets, deep dish pizzas, and much more. OU Kosher Certified, FDA food grade safe. Proudly made in the USA with American sourced materials.